Sleek silver settings can show off your favorite Dots. Wear matching Dots for a sophisticated look or mix them up for a playful touch. You can create a new custom look every day just by changing out your Dots! This bracelet is a must if you are in love with Style Dots as much as I am. I love toggle bracelets and this one is fun. I wear my favorite basketball team colors with the basketball in the middle. If you love the Dots you need this. You can make so many different combinations, my children's birthstones, team colors, seasonal Dots, or just favorite shades of one color. I could wear this everyday and have a different look. 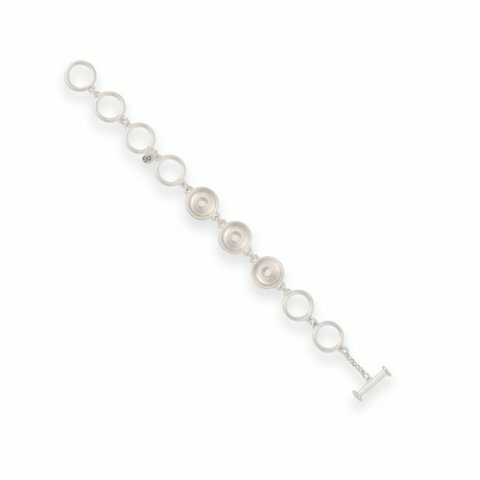 I love the the options this bracelet gives you to mix and match Dots to make such a beautiful created bracelet. I love wearing my kids birthstone color dots in it, like a mothers ring but instead, a mothers bracelet. This bracelet is large enough for my large wrist. I love how the Dots stay on top because the bracelet doesn’t turn on my wrist.